May the metal gods bless Fleshcrawl. Labels come and labels go, trends fly and wither away and yet Fleshcrawl remains steadfastly devoted to its art. It all started in February of 1987. Several friends influenced by Death, Slaughter and Slayer got together in Southern Germany to jam. Monikers had to be changed more than once for obvious reasons - bassist Amann finally found the Fleshcrawl monicker in a Melvins’ song - and a demo called Festering Flesh appeared in early 1991. In August of the same year the band recorded a 7" for the very young Morbid Records (MR002) featuring the songs Lost In A Grave and Evoke The Excess. Guitarist Alfred Handke's departure was followed by the band's signing to the German/Swedish label Black Mark in May of 1992. The band began a long tradition of recording in Sweden and entered Stockholm's Montezuma Studio and recorded Descend Into Absurd which is released late 1992. The album was a deadly and doomy affair which sported a cover by Uwe Jarling recalling Dismember's debut. Handke's replacement Schmitt left the band in November, 1993 and was replaced by another Hanus. Again in Sweden, this time at Dan Swano's Unisound Studio, Fleshcrawl recorded a much more Carcass-influenced affair called Impurity. Impurity legitimized Fleshcrawl's arrival as a serious death metal contender. With Black Mark not being disposed to sending bands on the road (so far only Invocator had toured from their roster), Fleshcrawl is fortunate to open the Bash Easter Festival in 1995 for, among others, Deicide and Cathedral across Europe. 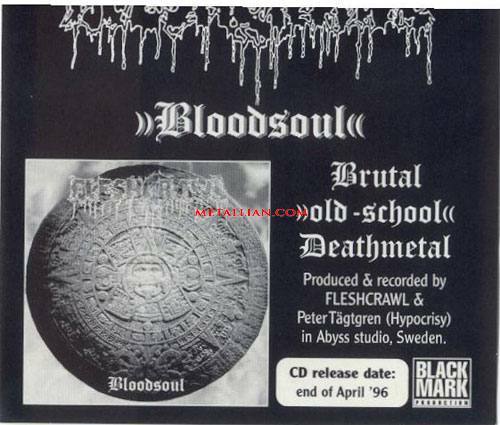 At the end of 1995, the band entered another Swedish studio and recorded Bloodsoul. Recorded at the Abyss Studio, Bloodsoul established the band as a Swedeath band with Mike Hanus especially veering the band in this direction through his song writing. In the meanwhile a lack of interest in metal had propelled Amann and Pretzer out of the band (Mike plays bass on the third album) and Herzog had managed to find work producing and live engineering for other bands. Annoy bassist Dietmar Schweikart comes and goes in 1996. Bloodsoul is the band's last work for Black Mark whose inability to work for its band is increasingly causing sniping between the roster and the label. Fleshcrawl initially signs with Invasion Records of Berlin, but when that label suddenly disappears, Fleshcrawl sends Metal Blade Europe's Michael Trengert a tape leasing to a new contract. Albums follow and the band tours with the likes of Kataklysm and Bolt Thrower. Fleshcrawl drummer Bastian Herzog joined the reformed line up of fun punk band Tauchermeister (formerly Die Taucher) on a part time basis in 2000. Fleshcrawl was crisscrossing Europe with Vader and Vital Remains in that year. The band had to leave a badly organized tour with Vital Remains and Vader after its front man was gripped with a bad case of flu. In January of 2002 Fleshcrawl opens a European tour for Benediction and Bolt Thrower (with Disbelief in tow) and has yet to hit North America - a band goal. Soulskinner was recorded at Sweden's Studio Underground. Guitarist and band founder Stefan Hanus left the fold in the summer of 2002 and was replaced by Oliver Gbravac. Gbravac's debut appearance with the band was that summer's Wacken Open Air Festival. The guy travelled to Sweden once again in order to record a new album in December of 2003 at Studio Underground. Made Of Flesh appeared in early 2004. The band was auditioning bassists to replace departed man Tobz in the summer of 2005. The German death metal band recruited bassist Nico Scheffler in March of 2007 and announced it would soon enter the studio in order to record an album. The band’s Structures Of Death album was out in the autumn through Metal Blade. This album (possibly in America onlt) was only available as mp3! The band had three shows lined up in Mexico for summer of 2010. Manu Markowski joined on bass in 2011. The band and Meat Train were playing shows in Europe in 2017. The band was booked at Eindhoven Metal Meeting in 2018. Like a fresh breeze in the Nevada desert, German death metal merchants Fleshcrawl have dumped the shackles of Blackmark and signed to Metal Blade (unfortunately Europe only) and belted out yet another tasty Swedeath slab of aggression. There simply is no justice in this world, when these guys can't even get a Canadian release (on the other hand given the incompetence of the jokers here it might not be a bad thing), and have to resort to mailing promos themselves after all these years, but never mind all that...if death metal is your cup of blood, then your CD has arrived. Armed with a new line up, the band has once again traveled to Sweden to record yet another heavily distorted record with titles like Embraced by Evil, Under the Banner of Death and Feed the Demon's Heart with a sound that especially on the latter song is inspired by early Entombed et al. The intro is simply a bore-inducer, I could have done without even more meaningless covers and the cover art work proves again why LPs are superior to the minuscule nature of CDs, but here is the bottom line: Fleshcrawl have delivered in the death metal music, vocals, lyrics and art work departments and there really isn't much more of a recommendation than that. - Ali "The Metallian"
Germany's longest-running dispensers of Swedeath are back with a new album called Made Of Flesh featuring songs like Flesh Bloody Flesh, Made Of Flesh and Carnal Devourment which features the line 'Before You Touch My Bloody Guts/Your Flesh Will Be Mine.' Motifs aside, In a world of constant disappointments it is always delightful to hear a new Fleshcrawl album. The band has maintained its poise over the years and sustained its speed, heaviness and loads and loads of Swedish distortion in the best traditions of Entombed and Dismember. There was some concern at Metallian Towers that the departure of founding member and guitarist Stefan Hanus would put a dent in the band's delivery, but it is now possible to say that the new album is no variation from theme. Having said that, the quintet really should record a few more guitar leads next time around. The music demands it. Another notable is the absence of (yet another) cover song on Made Of Flesh. Whereas the band's previous albums consistently featured a cover version or two, the new release is ten songs of pure molten death metal. Play tip: When life Surrenders. - Ali "The Metallian"
Amidst a contemporary landscape where the sands of time muse the ebb of power, integrity and purity; at a moment in this decade when 'metal' is as harsh and abrasive as reality is an illusion, the wave corrects itself through the rare element, which exudes resiliency. A torch bearer - yet a victim too. An exception, yet all the more valuable for it. This Ausnahme is a German band. They have released three albums and are signed to Black Mark Production of Berlin. Their name is Fleshcrawl. - 1996. If the powers at the record company have come to understand, the fans always have. The band is Fleshcrawl. The album is Bloodsoul. The style is death metal. The references, therefore, are impeccable. Immerse yourself.